The fauna and flora of tropical West Africa is, in the most part, poorly studied and barely and non-technical information is available for visitors and residents alike. Even specialized, technical information is limited as evidenced by many revisonary papers that do not include material or records from many West African countries. This is particularly true of Gambian invertebrates (other than butterflies), which form the main focus of this book, which includes many new country records even at the ordinal level. The contents include a brief introduction and scope including what is known about the Gambian fauna and flora and the climate and geology of The Gambia, including the various different habitat types. This is followed by the field guide section, with everything illustrated by beautiful close-up colour photographs of live animals taken in the field. Sections include: Flowering Plants (102 photos), Fungi (16 photos), Mammals & Birds (18 photos), Reptiles & Amphibians (28 photos), Dragonflies & Damselflies (14 photos), Cockroaches (4 photos), True Bugs (32 photos), Grasshoppers & Crickets (10 photos), Antlions & Lacewings (9 photos), Termites (4 photos), Mantids, Earwigs & Web Spinners (12 photos), Beetles (54 photos), Moths & Butterflies (90 photos), Ants (8 photos), Sawflies, Bees & Wasps (28 photos), True Flies (22 photos), Spiders (78 photos), Other Arachnids (12 photos) and Millipedes & Centipedes (8 photos). The book concludes with short sections on biodiversity and conservation issues and additional resources for those wanting to seek further information. The final page of acknowledgements includes many internationally recognized taxonomists who are experts for various different groups, adding confidence in the identifications provided, many of which are to genus and species level. Apart from being an extremely useful introduction to the flora and fauna for a general readership, the work is also of important scientific value. Many of the species illustrated represent new records for The Gambia and even West Africa in general. This is true even for well-studied groups such as butterflies, e.g. Azanus ubaldus (Lycaenidae), previously unknown in The Gambia! Most of the spiders represent new records of taxa previously known only from eastern of South Africa...and this is probably true also for many of the other insects. The order Ricinulei represents the first Gambian record and the northernmost record on the African continent. Several of the photos also illustrate extremely interesting behaviours, such as predation in several groups including dragonflies, spiders, bugs and flies, camouflage and mimicry in bugs, beetles, moths and spiders, milking of scale insects, harvesting of insect eggs and colony migration by ants, parasitic behaviour of wasps on spiders and cockroaches and even parasites of humans represented by a tumbu fly larva and a tick both firmly embedded in the skin of the author. There are clearly additional species not illustrated in this guide (full coverage would be a huge undertaking), but this book covers those most likely to be seen during a short visit. The book is primarily aimed at identification in the field, so text has been kept to a minimum. It should be of interest to anybody with even a passing interest in natural history of The Gambia and West Africa in general and is good value for money, given the low price and large number of high quality photographs. The author is a Visiting Research Fellow at the University of Manchester, UK, who has spent several years in The Gambia. 1. 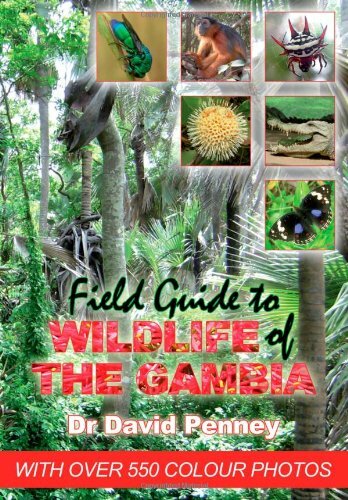 Field guide to wildlife of the Gambia: an introduction to common flowers and animals.